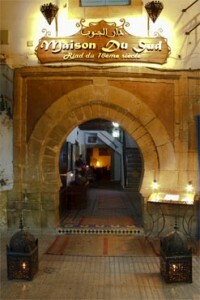 Riad Maison du Sud – an authentic hotel experience. Located 300m from the sea, Riad Maison du Sud is a beautifully restored 18th Century hotel set at the heart of Essaouira’s bustling medina. Luxuriously renovated in Moorish style, the 24 roomed Riad offers an authentic mix of Moroccan and Andalusian architecture, design and style, making it the perfect boutique residence. The Riad has many quiet salons to relax in as well as two large rooftop terraces with sea views to enjoy breakfast on whilst the service at the Riad is attentive yet understated in the long tradition of Morocco’s finest establishments.